1. If you prefer thicker yogurt, combine the 1/3 cup of milk with the milk powder, whisk until smooth, and set aside. 2. Bring the milk to the boil in a heavy, 3-litre/quart saucepan, stirring constantly. Remove milk from the heat and whisk in the optional powdered-milk thickener. Transfer the milk into a sterilized container and set aside to cool. 3. When the temperature of the milk has reached 46°C/115°F, add the yogurt starter and whisk until smooth. The milk temperature should not exceed 44°C/111°F, which is the ideal culturing temperature. 4. Place the container of warm milk in a warm place for 4 – 6 hours. You can place the container inside a sealed plastic bucket of warm water or wrap it in a towel or heavy blanket. The container may also be placed in an oven with the pilot light on, in a preheated electric oven which has been turned off, or in a wide-mouthed thermos flask. 5. Check the yogurt after 5 hours. It should be thick and firm (it will become thicker after refrigeration). Refrigerate, covered, and use within 3 days. 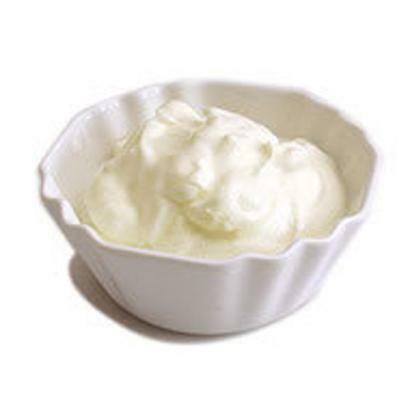 After three days, the yogurt makes an ideal curdling agent for production of Home-made Curd Cheese (Panir).